Easy Sharpie Crafts for Parents and Kids Too! Well on this dreary, rainy, stay home day, Caleb and I have really made the best of it! Tons of cuddles, bible stories and songs, and games being played here. While he napped though, I had some fun of my own with these awesome Sharpie crafts! 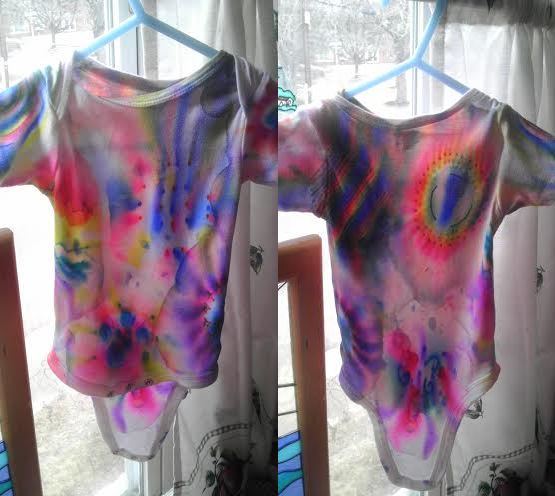 This is a GREAT way to Tie Dye because not only is it cheap and done with something most people already own, but it’s also mess free and relies on your own decision of design and color. All you need for this is a couple of Sharpies and Rubbing Alcohol. To make circles like the onsie kind of had you will also need a cup and rubber band. If you go with the circle design, place the shirt over the cup and wrap a rubber band around it to stay in place. Next just draw your pattern. Try to avoid complimentary colors next to one another because when they blend it will turn an icky shade of brown. Once you finish drawing, dribble the rubbing alcohol over it and watch the magic happen. You can do this until the whole thing is covered or just a little are. I saw someone who made “firework” shirts for her dance students who were dancing to Firework from Katy Perry and she had three circles on each. Once these are air dried, I recommend throwing them in the dryer for a little while, then hand washing them to get the alcohol out, then drying them again. I’m wrapped around my little man’s finger so of course I had to include him in these. I love how simple it is though. Next time I do it, I’m using white cups and I’ll be putting some more effort into the design, but for a test this worked out fairly well and it’s a cute little keep sake. This also makes an amazing gift for things such as Birthdays and Mother’s Day. All you need is an oven, coffee cup, and Sharpies. It’s really this easy. There is no real trick. Draw on the cup, try to avoid the top or just draw on the opposite side you are sipping JUST IN CASE IT RUNS, then pop it in the oven at 350 degrees for 30 minutes. Turn the oven off and leave the cups in for about half an hour more so they cool with the oven. Then take them out and let them cool completely. You now have a permanently personalized cup. These are both wonderful activities for toddlers. 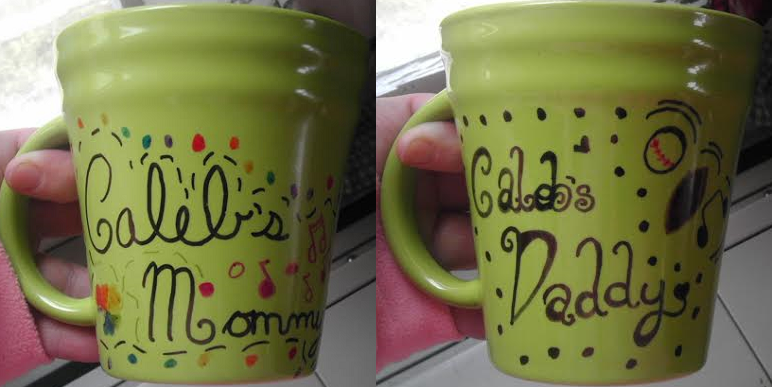 What mom wouldn’t want a personalized cup from her two year old? Play around with it. Use it to teach shapes and colors. There are so many uses and it’s so easy that much planning isn’t needed. Good luck, have fun, and thanks for reading!